Point taken. But call me old-fashioned. As I never tire of saying, you must be able to define your business in a few (three at the most) short, sharp sentences. Just ask my old friend, the fitness coach for pregnant women in Kensington. In fairness, ten seconds is a remarkably short time. And they probably didn’t have much chance to prepare. But what about 30 seconds? 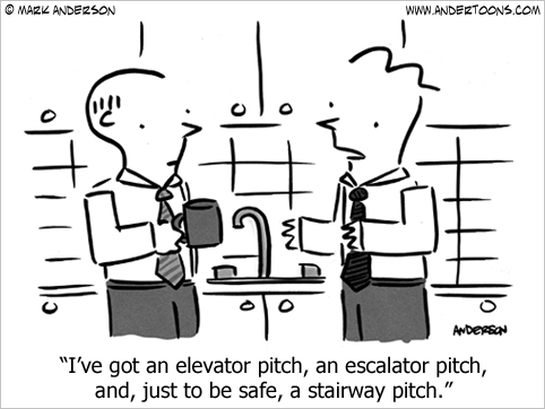 The elevator pitch? There are plenty of times when we all have to describe our business in that time. And yet very few people manage to be short, succinct, persuasive – and memorable. You can say a lot in 30 seconds. If you’re making a speech you’ll speak at between 120 and 140 words per minute. So 30 seconds gives you 60-70 words. So here’s the challenge. Can you do that? Short, succinct and everything else in 30 seconds. What do a builder, a manufacturer and the owner of a software company have in common? The insight and experience to help each other achieve their vision. The Alternative Board makes this possible for business owners like you. But in the meantime, there’s an even more important 30 seconds looming for all of us. Today is November 13th. Christmas Day is exactly six weeks away. 52 days from now we’ll stumble back to our desks to start another year. And the single biggest key to success in 2016 is simple: knowing what you want to achieve. So here’s another 30 second challenge: can you define your goals for the coming year in that time? Can you clearly, simply and unequivocally say what you want to achieve? If you can’t – even if you have a long wish-list tucked away somewhere in Evernote – you’re in trouble. In 2016 I want to provide an even better experience for my current board members. And I want to help 10 more business owners in York get more out of their business and their life. That’s 35 words: the definition of TAB was 38. So the definitions are short – and for me, they’re memorable. Every second of every day, I know what I want to achieve next year. And everything flows backwards from there: the marketing I need to do, the people I need to speak to… Everything. Doing those two exercises will be some of the most useful time you’ll spend between now and the end of the year. And when you flick the office lights on in just over seven weeks’ time you’ll be focused on what’s relevant and what’s going to move you towards your goals. Equally importantly, the 30 second definitions will tell you what’s irrelevant: what’s simply vanity or window-dressing.